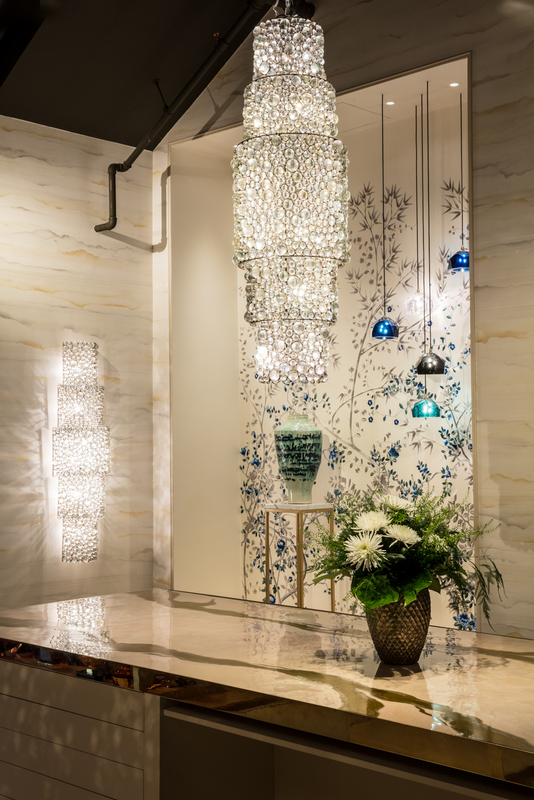 We collaborated with leading interior designers Maddux Creative to breathe new life into our showroom and create optimal spaces to display our exquisite handmade wallpapers. We’re delighted with the results and hope you can visit sometime soon. Having debuted at Deco Off a couple of months ago, our much lauded Bruyère in weld colourway is showcased together with a cabinet by Justin van Breda. 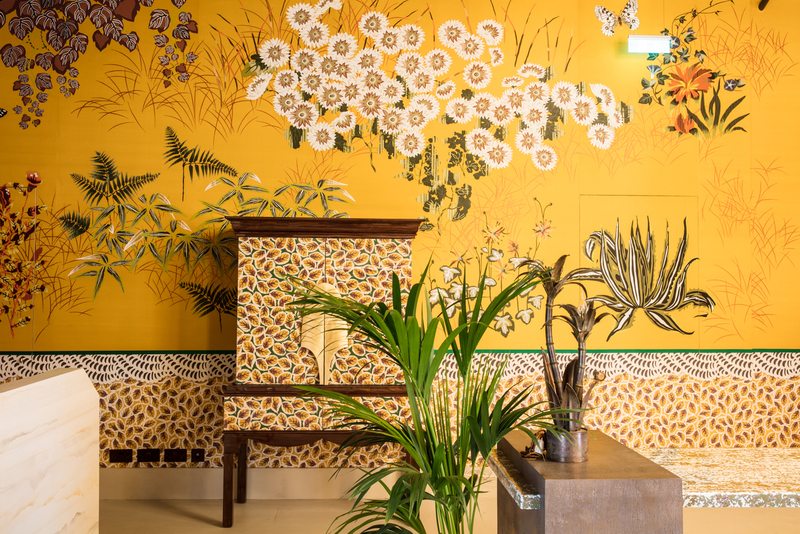 Eloquently staging its own mid 20th Century style revival, we once again aim to redefine the panoramic aesthetic with this bold, dramatic hand-painted wallcovering inspired by the phenomenal tapestries of Jean Lurçat. Bruyère blends the abstract and the figurative in its rich and multi-dimensional detail, creating a luxuriously abundant scenic. 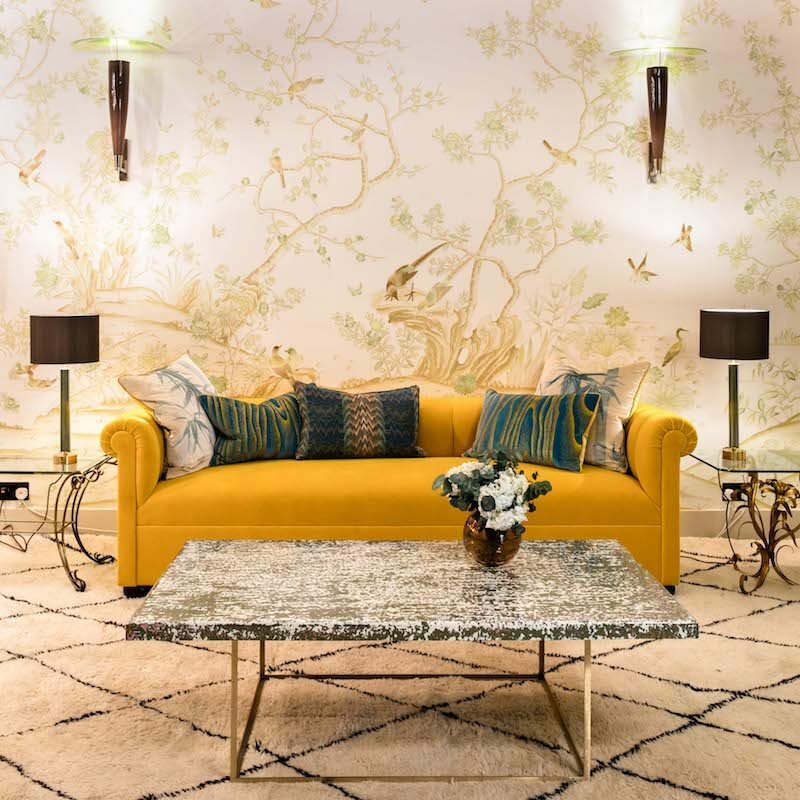 Lending an exotic feel, Shimla is an interpretation of 19th Century French scenics, offering an idealistic view of India’s tropical landscapes, rendered as a hand-tinted engraving. The Tiki chairs are upholstered in a custom fabric designed by our good selves and the rug is courtesy of The Rug Company. 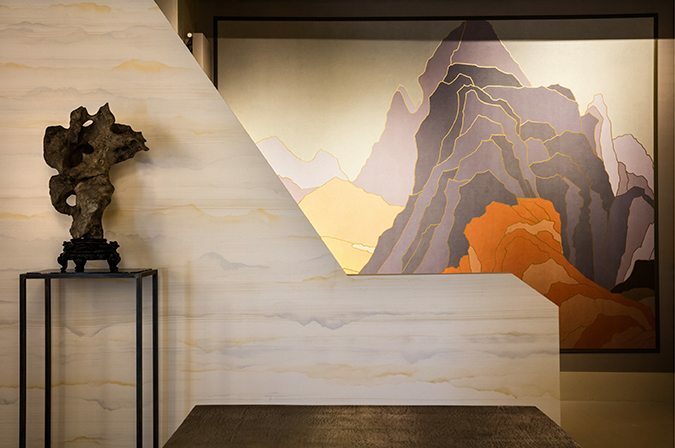 Our ever-popular mountainscape Rockface appears in an eye-catching new colourway, printed with hand-finishing. True to very early 18th Century chinoiseries, our bold, whimsical Folly is hand-painted and embroidered in an astonishing custom colourway. Thanks to George Smith for the sofa and armchair. 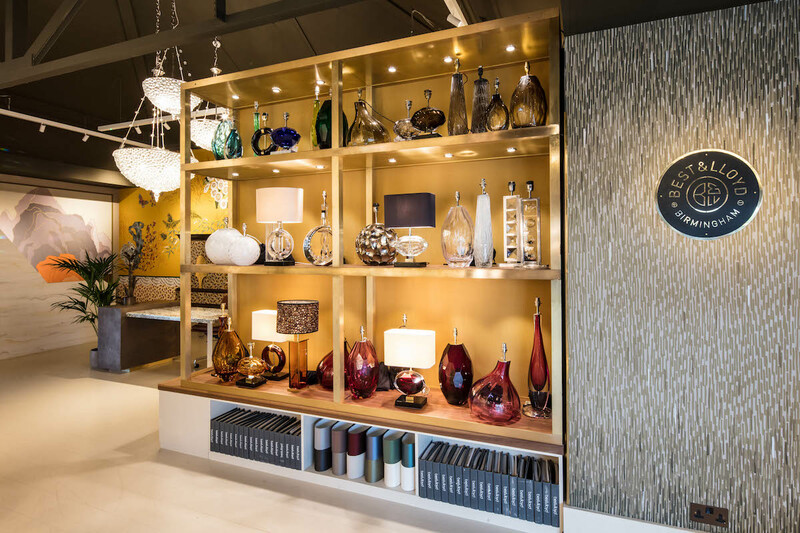 Best and Lloyd display their latest collections of handcrafted lighting. 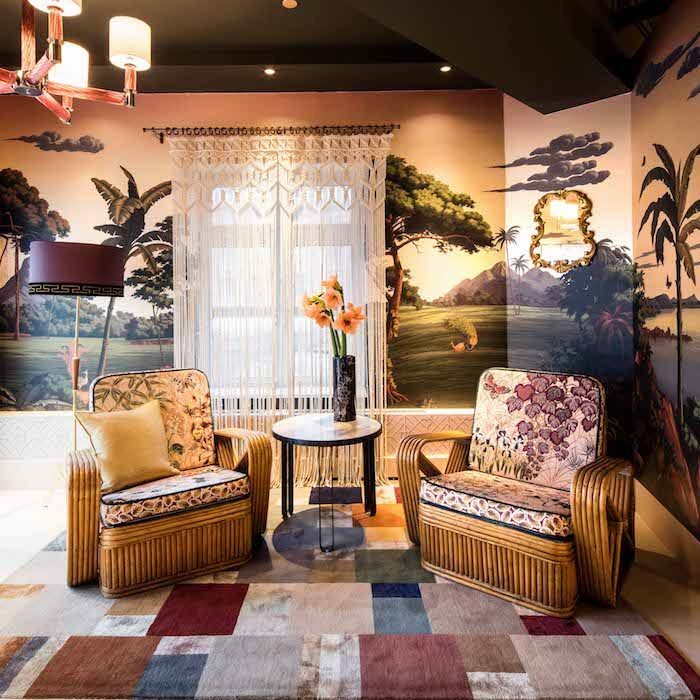 Our textured, hand-painted wallcovering Paille appears to the right, recreating the lighting effects on the straw marquetry walls by Jean Michel Frank. Watch out for the stunning, limited edition, fully embroidered custom paradiso chinoiserie in custom sapphire colourway. The enclave is surrounded by our shimmering, textured Travertine design, hand-painted in Epsilon colourway. The desk is courtesy of Solomon and Wu.